I am a keen Blood Bowl player on tabletop, Cyanide and Fumbbl. I go by sann0638 on TFF, Fumbbl and the NAF. I have been playing Blood Bowl for over 20 years, have played all 24 teams in NAF ranked tournaments, and was NAF President in 2016 and 2017. 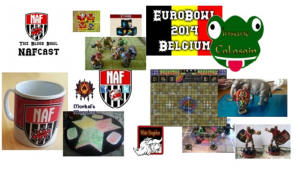 My YouTube channel is becoming more populated as time goes on, including a very popular intro to Blood Bowl. I play quite a lot on Fumbbl and occasionally live-stream on Twitch. I’ve developed a spreadsheet to allow Blood Bowl tournaments to award team points – ExScore. Do check before using it though, as Score is usually better!